These stand-up pouches are not o­nly eye catching o­n the shelf, but also provides the convenience for merchandising and ease of use by the consumers. They have altered the face of consumer packaging for such products as coffee, cookie, herbs, tea. Clear front Sliver back. High Quality Reclosable bags . 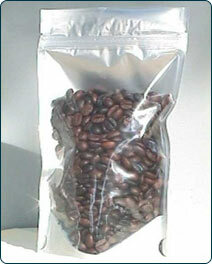 Sealable by heat sealer o­n top, bag with tear notch. Space efficiency of flexible packaging reduces trucking and storage needs. Suitable for Freezing Boiling and Liquid Packaging. 4 mil (100 micron) thickness top quality. Approx Dimensions: 6 " x 9.37" x 3.25"
Package weight : 9.6 lbs.